The 100 marches towards the mid season finale with another strong outing. Not as strong as previous weeks but still really compelling television. As with each episode in the second season of The 100 there is a lot going on but the story juggles all of these elements well. Rarely does a situation or a character feel rushed or wasted and the episode still retains a steady pace throughout. I really like the Mount Weather storyline in general. There are so many layers to the storytelling and clearly a variety of motivations going on here. Maya is clearly unhappy with the way things work there as evidenced by her telling Monty and Jasper the truth. This tells us that everyone in Mount Weather knows what’s going on and there’s a difference of opinion over whether it’s right or not. Maya obviously feels that it’s wrong so takes the opportunity to do something about it now that it exists. There was an interesting moral debate thrown in when Maya pointed out that they would die without their “treatments” and Monty told her that their death is what should happen. Clearly Monty has been hardened by his experiences on Earth and he has a more black and white moral view than he once had. Dante is proving to be a really fascinatingly layered character. His motivations are pretty unclear at this point but I do feel that he genuinely wants to protect the 47 and thinks that using them without their permission isn’t right. The flip side of that is he doesn’t extend that same courtesy to The Grounders who are somewhat less than human in his eyes. It’s an interesting contrast and I wonder what it is that makes one group more human than the other. His conflict with his son Cage illustrates these clear differences in his mind and builds up some interesting conflict in this story. Kane and Jaha’s situation was really well played though a little obvious. When Kane said that their cellmate was “just an innocent girl” it was immediately obvious how this would turn out. It wasn’t an easy episode for them by any means as they were given the choice over who dies in penance for what Finn did last week. The two actors played this well and Kane’s eventual sacrifice was actually quite a shock in general. I do have my issues about how quickly this story is moving given how quickly Jaha is reunited with the others from The Ark. It’s still good stuff but giving it more time to take advantage of some of the interesting scenarios would be more beneficial. Going back to Finn’s crime against The Grounders the handling of this was pretty bizarre. Apparently he massacred 18 people and didn’t really suffer any consequences as a result of this. He was allowed to walk around and was sent out on a mission right away. There’s an attempt to qualify this when Bellamy and Raven say that they’ve all had similar issues. The only person treating this properly was Clarke who was almost afraid of him. This should have been a big deal and Finn’s insanity has enough potential to last the rest of the season. It’s a shame that this episode was very much the start of his healing. It shouldn’t have been shrugged off like this. 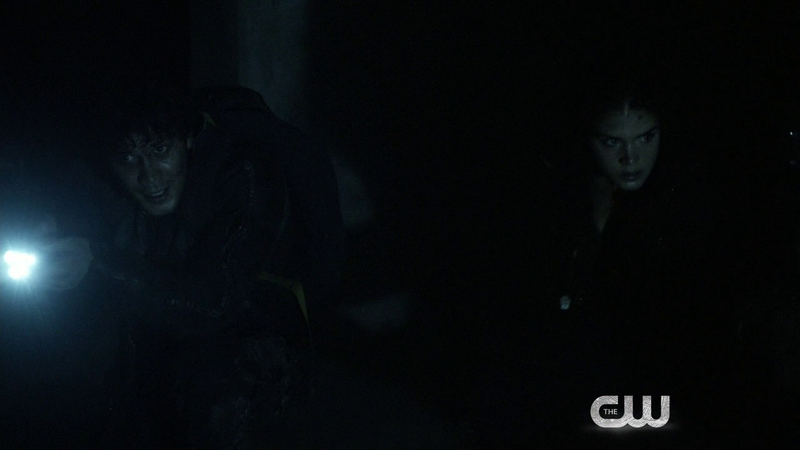 The absolute standout sequence was Bellamy, Octavia and the Expendables being attacked by Reapers in a parking garage. It was dripping in tension and the mundane looking setting contrasted with the horror made the whole thing really unsettling. I was very much on the edge of my seat the whole time. The inclusion of Christmas music was a perfect touch to ramp up the creep factor of the whole thing. Lincoln being one of The Reapers was a huge surprise. I didn’t expect this change from him so soon and having Lincoln be one of them added personal stakes for the group. Octavia in particular is personally affected by this and showed plenty of strength of character here. I would go as far to say that this is one of the most effective sequences The 100 has done and I hope this is a solid indicator of what’s to come. The Reapers are a great antagonist and give off a distinct Zombie vibe but there’s more autonomy to their actions than that which helps make them more threatening. They’re a nice middle ground between human foes and Zombies so they’re perfect for a viable threat. There was something of a predictable character arc for Abby here as she and Clarke were at odds over going to save the 47 people trapped in Mount Weather. Being separated by Clarke due to some The Hunger Games: Catching Fire style killer fog causes her to realise how important Clarke is to her and pay attention to how important saving the people trapped in Mount Weather is. None of this was especially bad as such and I really liked her lack of willingness to be separated from her daughter again. This works as she’s had to deal with it once and doesn’t want to do so again. It was a little predictable that this change of heart would happen. I do find it interesting that there are opposing loyalties impacting Abby’s rule of the group. Raven showed this when she directly throws Clarke’s perceived decision in Abby’s face and at a different point when she handed the binoculars to Clarke instead of Abby. Raven has always been a character not afraid to assert herself in her actions and opinions so her siding with Clarke being obvious makes sense here. I also love how her technical prowess is helping keep the group alive. This show isn’t afraid to make her a tech geek and it works perfectly from a narrative point of view. Another strong outing of this show with some weaknesses regarding the handling of Finn’s massacre from last week. It was more or less glossed over which doesn’t make any sense from a character development point of view. 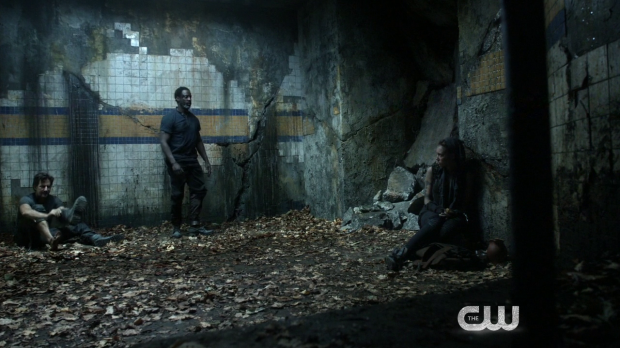 Jaha and Kane’s scenes were really intense and had something of a shocking payoff. The two actors handled these moments perfectly and the gravity of their decision was always at the center of the discussions. The Mount Weather storyline has proven itself to be a continually complex and layered narrative with lots of differing motivations making for some really interesting scenes. Dante is definitely a complex character with mysterious motivations but more of how he sees people is betrayed here. It’s interesting how he thinks of the 47 “guests” as being human but dehumanises The Grounders. This contrast is a really interesting one and I do wonder how it’ll play out. A sequence involving Bellamy and Octavia being hunted by reapers in a parking garage was nothing short of incredible. The setting was great, the rising tension and stakes worked perfectly and there was a creepy vibe about the whole thing. It is one of the best sequences this show has ever had.